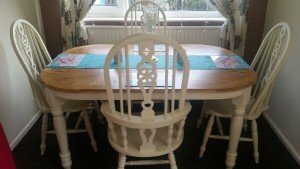 A solid wood farmhouse dining table, together with four matching rounded back dining chairs. 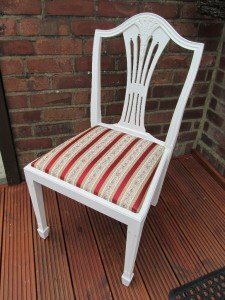 A hand painted white solid wood high back hall chair, upholstered to the seat in red and cream satin. 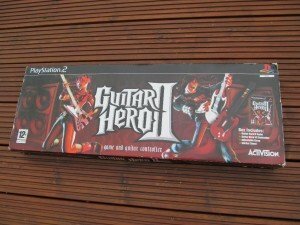 A brand new boxed Guitar Hero 2 kit for playstation 2, comes with game and guitar controller. 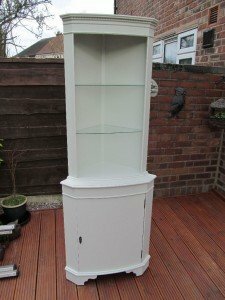 A tall standing hand painted solid wood corner display unit, having two glass shelves above a cupboard. 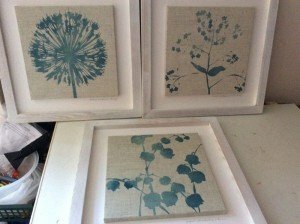 A set of three wood framed wall canvases, each depicting teal flowers against a cream ground. 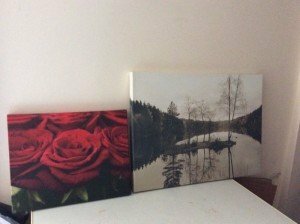 A large wall canvas depicting a lake and forest scenery, together with another wall canvas depicting red roses. 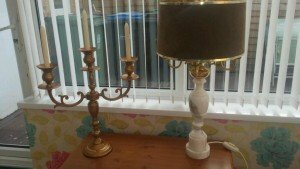 A large vintage marble base table lamp and gold rimmed shade, together with a three branch brass candelabra. 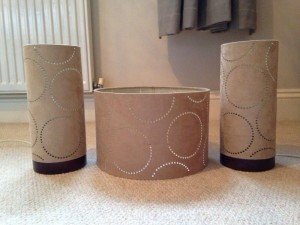 A pair of cream suede cylindrical bedside table lamps on wood bases, together with matching lampshade. 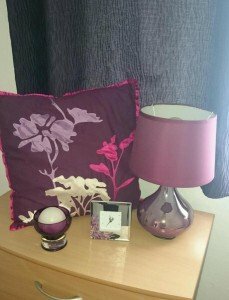 A collection of purple home accessories, to include a table lamp, a throw cushion, a clock and a candle. 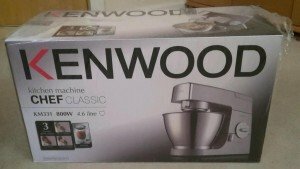 A brand new boxed Kenwood kitchen machine chef classicKM331 800W 4.6 litre. 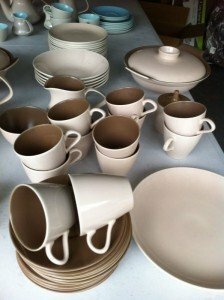 A large collection of Poole pottery, to include a lidded casserole dish, a milk jug, a lidded sugar bowl, plates, cups etc. 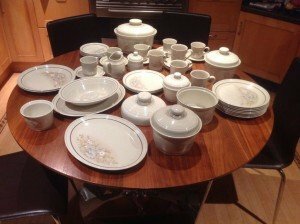 A Royal Doulton Florinda dinner service, includes casserole dishes, cups, jugs, plates, platter dishes etc. 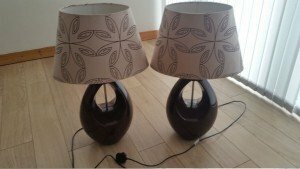 A pair of black ceramic table lamps and shades, the shades decorated with a black floral pattern against a brown ground. 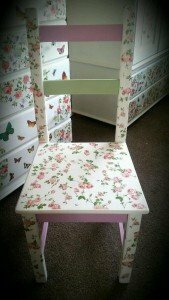 A vintage solid wood high back hall chair, hand painted in pink and lime green and decoupaged with floral paper. 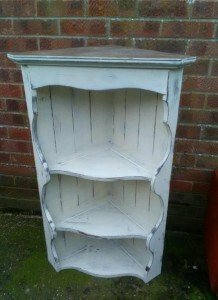 A solid wood hand painted corner shelving unit in the shabby chic style, having three small shelves. 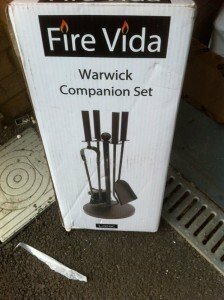 A brand new boxed Fire Vida Warwick cast iron companion set, includes a stand, poker, brush, shovel and tongs. 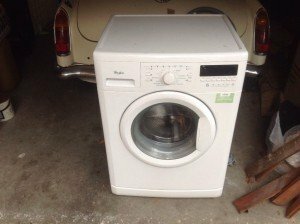 A white Whirlpool large capacity under counter washing machine. 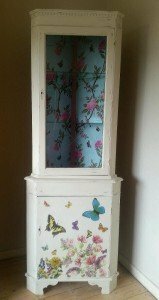 A tall standing solid wood corner display cabinet, hand painted in white with a colourful butterfly decoration. 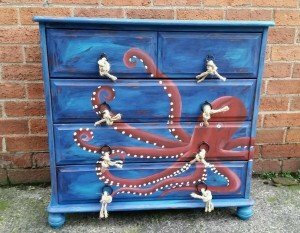 A solid wood nautical themed chest of two over three drawers, hand painted in blue with a large octopus mural. 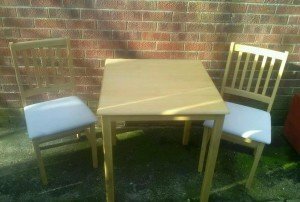 A solid wood square breakfast table, together with two matching dining chairs upholstered in white fabric.